The Japanese variety show Generation Tengoku did a 2 hour special to celebrate the 45th anniversary of Weekly Shonen Jump. 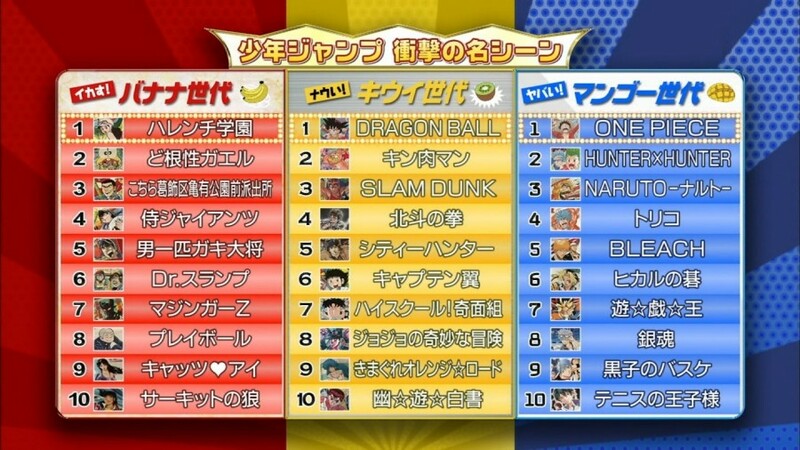 It was shown that since the publication of the first ever volume of Weekly Shonen Jump, back in 1968 there have been three main generations of manga series and the audience that read them. Those who read series between 1968 to 1984 belong to the Banana Generation, 1985 to 1999 belong to the Kiwi Generation and those who read them from 1999 onwards belong to the Mango Generation. 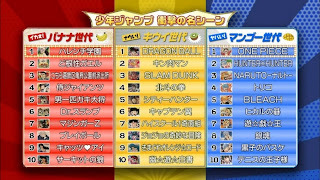 Generation Tengoku then listed the best series from each generation.